What Do David Rovics, Einstein and the Bay Area Light Brigade Have in Common? November 18, 2014 at 9:36 pm. Einstein the candidog, that is. The answer is… they were all at the Berkeley Post Office Monday, November 17th, along with some fifty other people, biting the good bite, lighting the good light, and singing against might makes right into the night to save the Berkeley Post Office from the privatizers with music and community. 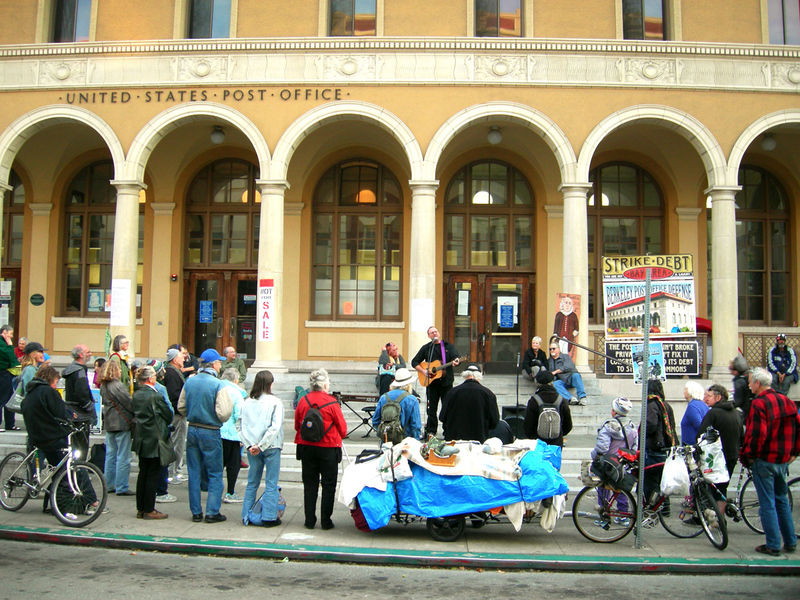 Berkeley Post Office Defenders put together the mini-concert, featuring David Rovics on the guitar singing “If Only It Were True,” “Commons” and other anti-capitalist songs. What’s the status of the Post Office fight? When the Postal Service announced in late October that the building was “under contract” to be sold, the Occupation on the steps by First they Came For the Homeless – which had been Occupying outside of Staples previously – began and has been going on for two and a half weeks now. 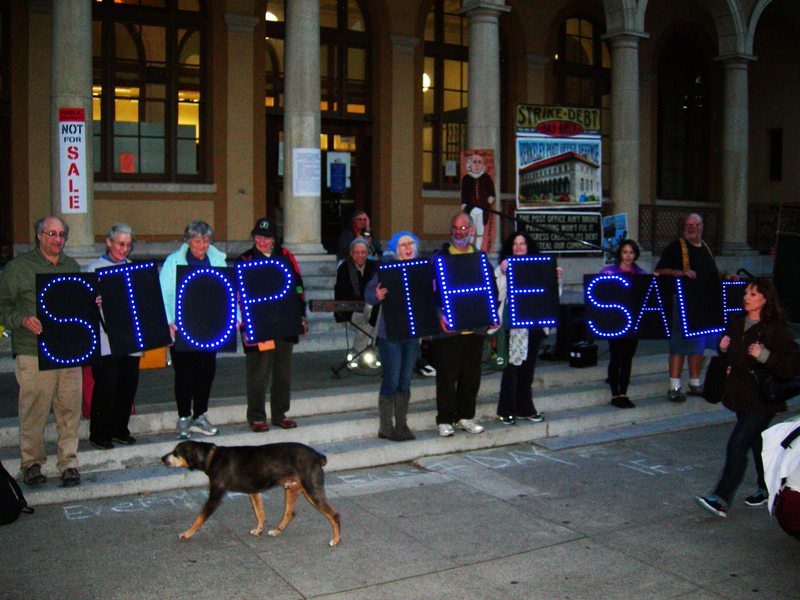 The City of Berkeley, with Attorney Tony Rossman as pro bono counsel, filed suit to stop the sale. A federal judge issued an immediate emergency temporary restraining order, blocking any sale pending a hearing. That hearing – to grant a permanent injunction prohibiting the sale pending resolution of the lawsuit – is due to be heard in San Francisco Federal Court before Judge William Alsup on December 11th at 8:00 AM. This suit is similar to a suit filed by the National Post Office Collaborate in Stamford, CT last year, claiming the Postal Service had not followed Federal law regarding the sale of historic properties nor federal law requiring environmental impact analysis before a sale could be proposed. In that case the Federal Court judge did issue a permanent injunction, and now various parts of the lawsuit are working their way through the judge’s courtroom.